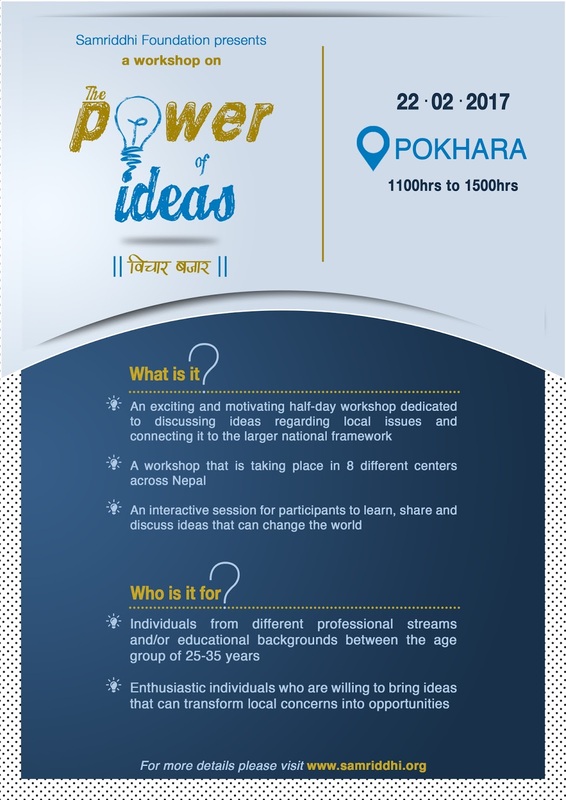 The Power of Ideas is an exciting half-day workshop that will be held in eight different locations across Nepal. It is designed to discuss ideas that bring desirable changes in the way our societies function. Who is organizing the workshops? Samriddhi Foundation is organizing the workshops. Samriddhi is a Kathmandu based think tank that works for promoting and protecting civil, economic and political freedom in Nepal. When & where are the workshops being held? Workshops will be held in eight different centers across Nepal. Birgunj on 10th February, Chitwan on 13th February, Dharan on 22nd February, Pokhara on 22nd February, Surkhet on 22ndFebruary, Butwal on 25th February, Dhangadhi on 25th February, and Janakpur on 25th February. The venue for each area will be communicated to selected participants well before the event. This workshop is mainly designed for individuals of different professional/educational backgrounds and for participants between the age group of 25-35 years. Local residents of the areas selected are encouraged to apply! No, there is no participation fee. Selected participants will be enrolled for free. February 6, 2017 (For those applying to participate in Birgunj and Chitwan) and February 15, 2017 (For those applying to participate in Dharan, Janakpur, Pokhara, Butwal, Surkhet and Dhangadhi). The Power of Ideas is a workshop which will involve participants from diverse backgrounds and skills sets. As a participant, you will be involved in learning, sharing and discussing ideas which will lead to opening up of new perspectives and angles in local problem solving. You will be networking with like-minded people. You will also get to access Samriddhi’s other learning and engagement platforms. Successful participants will be awarded with a certificate of participation. How many seats are available for the workshop? There are only 16 seats per workshop. Shortlisted candidates will be asked to engage in a short phone interview, after which the final 16 will be selected. When will I know if I have been selected for participation? Upon selection, you will receive a selection email followed by a phone call from Samriddhi Foundation after the form submission deadline. The organizers will provide you with all the necessary materials that will be needed during the workshop. You will just have to show up with a lot of zeal and willingness to interact!